Music Evening in Day Centre. pick ups. Please call David on 0868091506. Annual General meeting of Crossmolina Deel-Rovers GAA Club on Wednesday 28th November at 8pm. All members, supporters and interested parties are welcome to attend. 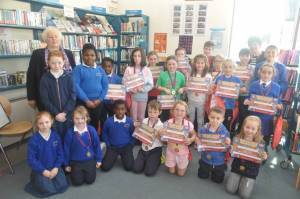 Classes in Ballina Family Resource Centre For children aged 8+ take place on Monday from 4.00pm to 5.30pm. Needles and wool will be provided to get you going. Ring 096 75573 for more info. Nurture – saving women’s Lives. Nurture is an affordable, accessible and professional support with a No-Wait Policy for women and their partners who need help surrounding Fertility difficulties, Depression in Pregnancy, Post-natal depression, Traumatic Birth, Miscarriage and other related illnesses. Ring the Family Resource Centre on 096 75573 for more information. Winter is here! Contact us for help with your winter chores. We will stock your weekly fuel, put out your bins or any other assistance that you may need to help you through the cold winter months. We will also stock sheds with winter fuel, clear the yard and the garden, clean guttering and carry out repairs. Phone us on 087 218 6560 or call to the Enterprise Centre for further information. We are so pleased that the NO NAME CLUB is restarting on November 26th at 8pm. Registration will take place that night, teenagers 16-18 are very welcome. Thank you to all those that volunteered to be Youth Leaders. There will always be room for more, if you are thinking of becoming a Youth Leader we are just a text away 087 218 6560, the more the merrier! Garda Sandra Rooney of Ballina Garda Station is appointed as the new member to join Crossmolina Garda Station replacing retired Garda Christie Kilbane. We welcome Sandra and look forward to working with her. 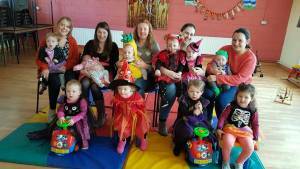 Kilmurray parent and toddler group enjoying their Halloween party in the Centre Back row left to right; Karly and Tricia Mullen, Sinéad and Méabh Cleary, Bailey and Maria Bourke, Caoimhe,Danielle and Aibigéal McDonnell, Alex Leonard and Caroline Kearns. Front row left to right Aoife Cleary, Heidi Bourke, Annie Leonard and Eimear Cleary. Will be in Crossmolina Parish Hall on next Thursday 15th November from 4 – 30 pm to 8pm. Please come along and bring a friend. Congratulation to Brendan Hughes Carrowkilleen and Jennifer Carter who were married in Holy Cross Church Ashton Keynes recently. They are wished many years of good health and Happiness from their many friends. The following are results for of the Weekly Crossmolina Bridge session in Hineys Thursday night 25th October. 1st Mary Garrett and Teresa McNulty 2nd Rita Fox an Ena Coggins 3rd Nuala Doyle and Maureen Barrett. Thursday night 1st November 1st Nuala Doyle and Maureen Barrett 2nd Mary Garrett and Teresa McNulty 3rd Mary Daly and Mariead Maughan. 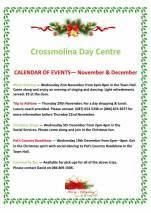 Crossmolina Day Centre are organising a Day Trip to Athlone on Thursday 29th November. To book a seat on the coach please contact 087 654 5338 or 086 874 3077 before 22nd November. Are you in fear of falling, being attacked or broken into in your own home, have a health condition that concerns you? Are you age 65 or older and living alone, living with another person who meets the eligibility criteria, living alone for significant periods of time during the day, or is a carer to someone else in their household, If so you could be entitled to a free Personal Alarm Panic Button. (Monitoring fees are free for 1st year). For more information please call in or ring The Ballina Family Resource Centre on 096 75573. Exercise classes for women take place every Wednesday morning from 11.00 am to 12.00 noon in the Ballina Family Resource Centre, Ardnaree. The group enjoy a chat and catch-up over a cup of tea/coffee after the exercise. We have a loyalty scheme in place. New members welcome. Ring 096 75573 for more info. The death occurred peacefully in the Gascoigne Nursing Home on Monday 22nd October of James (Jim) Davis Ranelagh Dublin late of Bridge St Crossmolina brother of the late Anthony Davis. Removal on Wednesday from Quinn’s of Glasthule to the Church of the Holy Name, Beechwood Avenue Upper, Dublin 6. Funeral on Thursday after Requiem Mass to Shanganagh Cemetery. Jim is survived by his wife Martina, sisters Vivienne and Marion, nieces, nephews, grandnieces, grandnephews, extended family and friends. May he rest in peace. Mayo Cancer Support (Rock Rose House) Operate a free counselling/therapy service every Tuesday from the Ballina Family Resource centre. Ring Jean on 0872804164 to book an appointment. 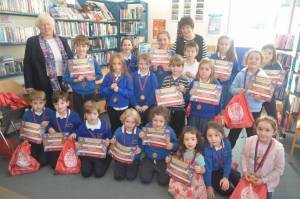 For parents of children aged between 6 – 16 years of age. Starting Tuesday 6th November at 10am to 12noon in Ballina Family Resource Centre and will continue over six weeks every Tues. Numbers are limited so booking is essential. Please contact Rione on 0862134078 or Ballina FRC at 096 75573.